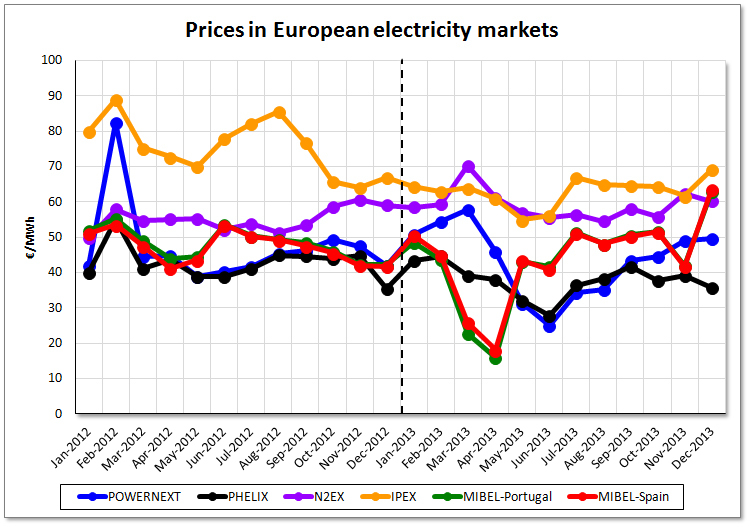 January 16th, 2014 – Prices in the main European wholesale electricity markets have diminished in 2013 compared with the previous year. The prices reached in February 2012, especially high because of the cold snap that hit Europe, have been determinant for such a decrease in 2013. The exception was the N2EX market that registered an increase of the average price compared to 2012. The two crucial factors for such an exception are that winter of 2013 in the United Kingdom was colder than the previous one, and the increase of the NBP gas price. Sources: MIBEL – OMIE, POWERNEXT – EPEX SPOT, PHELIX – EPEX SPOT, IPEX – GME, N2EX – NORD POOL SPOT. Prices of the N2EX market are expressed in €/MWh and are calculated from original values in £/MWh. The MIBEL market, in Spain and Portugal, registered very low prices in March and April 2013 (25.92 €/MWh and 18.17 €/MWh in Spain, 22.82 €/MWh and 16.08 €/MWh in Portugal) because of the increase in hydroelectric and wind production, together with the low energy consumption during the Easter holidays. The average price in 2013 was 44.26 €/MWh in Spain and 43.65 in Portugal, and represented, respectively, falls of 2.98 €/MWh and 4.43 €/MWh compared to the previous year. In both countries the year-on-year variation of the price was negative in the first two quarters, virtually null in the third quarter and positive in the last quarter (9.27 €/MWh in Spain and 8.77 €/MWh in Portugal). Such an increase in the last quarter was mainly due to the unavailability of nuclear power plants and the low wind production in December. In the French POWERNEXT market the average price for 2013 was 43.38 €/MWh. This represented a decrease of 3.57 €/MWh in the price compared with 2012. There was a remarkable price increase in March 2013, that resulted in a monthly average value of 57.78 €/MWh (13.13 €/MWh year-on-year growth), caused by the low temperatures and the nuclear power unavailability. However, the average prices for the first three quarters decayed compared with the same quarters of the previous year, while in the last quarter a year-on-year increase of 1.51 €/MWh was registered. The average price of 2013 in the PHELIX market was 37.78 €/MWh (4.82 €/MWh less than the previous year). In March, the effect of the low temperatures was compensated with the high solar and wind production. The year-on-year variation of the price was negative in all quarters of the year. The British market N2EX was the only one that registered a positive annual variation, which was of 5.45 £/MWh (3.98 €/MWh), resulting in an annual average price of 50.15 £/MWh (59.09 €/MWh) for the year 2013. In addition, this market registered for all quarters of 2013 higher average prices than the ones corresponding to the same quarters of 2012. It is worth noting that during the cold snap in March 2013, the NBP gas price entailed a growth in the electricity market price until a monthly average price of 60.26 £/MWh (70.20 €/MWh). In the Italian market IPEX, the average price during 2013 was 62.99 €/MWh, 12.49 €/MWh less than the previous year. In all quarters the average price decayed compared to the same quarters of 2012. 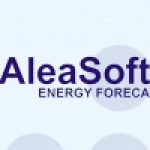 AleaSoft’s forecasts for 2014 indicate an increase of the price in the European electricity markets MIBEL,POWERNEXT and PHELIX. This increase is expected to be higher in MIBEL prices corresponding to Spain and Portugal, and lower in the POWERNEXT and PHELIX markets. In the British market N2EX, the price would be around the same values than in 2013. On the contrary, the average price in the Italian market IPEX is expected to be slightly lower compared with 2013. The average price of the Brent barrel was $108.57 during 2013, $3.16 less than the previous year. The average price in the two first quarters was lower than in the same quarters of the previous year, while in the two last quarters, values were similar to the corresponding ones in 2012. 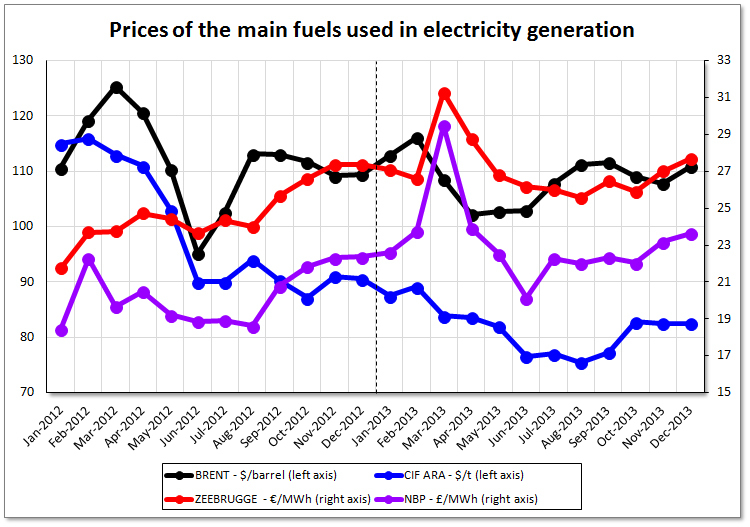 The low temperatures in March 2013 had an important influence in the Zeebrugge gas price as well as in theNBP gas price. The average price for the Zeebrugge gas reached the value of 31.24 €/MWh, 7.49 €/MWh more than in March 2012, and the average NBP gas price was 29.50 £/MWh, 9.83 £/MWh more than in March 2012. The average prices for the whole year 2013 were 27.10 €/MWh for the Zeebrugge gas and 23.16 £/MWh for the NBP gas, meaning, respectively, increases of 2.32 €/MWh and 2.86 £/MWh compared with the previous year. The price of European coal CIF ARA kept decreasing most part of the year, and in the last quarter it became stable around an average value of 82.65 $/t. The average price of a ton of coal during 2013 was $81.65, $17.55 less than the average of the previous year. The forecast issued by Aleasoft for the year 2014 indicate a slight increase in the Brent barrel price. BothZeebruge and NBP gas prices are expected to become stable in values similar to the ones registered in 2013. In the case of the CIF ARA coal, the forecasts indicate a slight growth of its price in 2014. 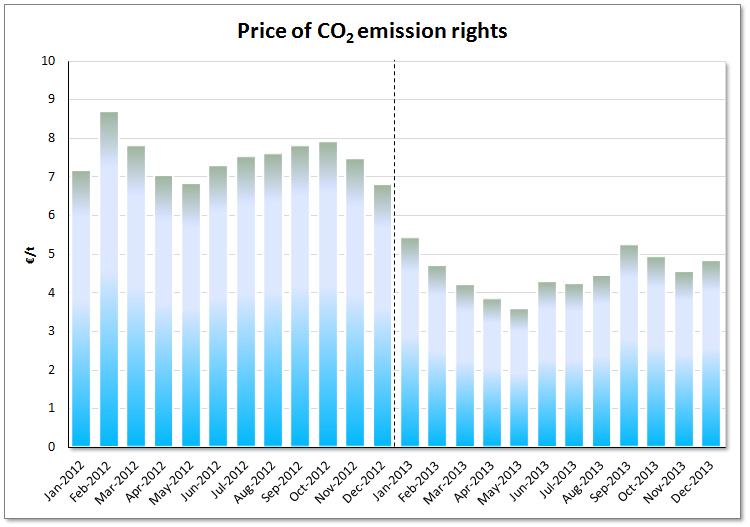 The price of CO2 emission rights has decayed during the first half of the year 2013, until a monthly average price of 3.58 €/t in May 2013. In the second half of the year, the monthly average price recovered up and the December value was 4.84 €/t. The annual average price for 2013 was 4.53 €/t, 2.96 €/t lower than in 2012. In 2014, an average value similar to the one in 2013 is expected.